You will be introduced to different types of puppets; shadow , rod , glove and marionette. You are introduced to design and development, drawing, printing, construction, sewing, pasting, painting, paper clay. You will walk away with one Puppet. 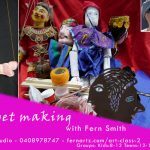 Workshops are held at Fernartz Studio with artist Fern Smith. You choose your preferred dates. For best outcomes age grouping works well such as: 6-8, 8-12 , 12-16 , 16-18 and 18-80+ years. Your purchase is valid for 12 months. Up to for four persons, pay less for more.